Face Clay Masks Rejuvenate All Skin Types. Clay masks therapeutic properties work especially well in acne treatments and for oily skin problems but they also give anti aging benefits to all skin types. These high quality natural earth clays remove the excess facial oil, decongest pores, and draw out impurities. Clarifying clay treatments can be applied all over the face or just in the T- Zone to control oil buildup and balance an excessively oily face without over stripping the skin to the point of dehydration. Applying these “secret weapon” beauty treatments 2 or 3 times a month to deep clean down into your pores will keep your complexion healthy and purified and also assist in removing facial blackheads, drying up blemishes, improve texture, rev-up circulation, and help neutralize skin. In combination with healthy skin care habits, these powerful, mineral-boosting treatments can be quite beneficial for improving circulation, increasing blood flow to the skins surface which helps in the anti aging fight to prevent premature lines and improve the overall health of the skin. Using natural recipes for treatment masks can be very effective for a natural acne treatment and sensitive types. They make an excellent tool in nourishing and it is the best way to guard against allergic reactions and flare-ups. 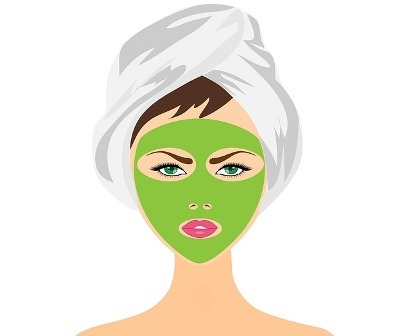 These easy face mask recipes can be perfectly suited for beauty care, health skin treatments at home. The various facial masks products are color coded to skin type. Hint-Just a dab on stubborn blemishes over-nite will work wonders. Botanicals are added to help heal and calm. A drop or two of your favorite essential oil fragrance (example-Tea tree oil-(healing boost) is very helpful in oily complexion remedies. * Products can be found at natural health/food stores and on-line. Chamomile is a fresh, sweet and fruity oil that will help to further enhance this anti-aging recipe. It has very calming, soothing, and relaxing effects and a good remedy for treating acne, and dry itchy problems, as well as inflamed and sensitive complexions. Pink masks are particularly useful for facial toning, lack of hydration, and restoring radiance by giving a boost to reclaim that healthy glow. Neroli oil has a strong, sweet, floral aroma. This precious botanical oil has a relaxing effect on the body and mind. The oil is especially beneficial for mature types and can help to stimulate cell growth, and prevent scar tissue and stretch marks. It’s that simple! Designed easy to make and apply, to see a radiant, healthier-looking complexion with refined texture and tone in your first treatment. Protect and nourish your complexion. Face moisturizers acts as a barrier from environmental hazards today and helps restore moisture, smooth rough texture and prevent dehydration. These facial clay masks are just an example of the many natural recipes available. A rejuvenating facial mask will help cleanse, detoxify, exfoliate, heal, sooth, tone, and unveil gorgeous skin.